Back in the 1970s I was teaching French in a Hertfordshire school. My Head of Department was a real music enthusiast so we hit it off on that level alone. He was extremely knowledgeable and prided himself on the breadth of his knowledge. One day he gave me a challenge to make a tape — that dates it — of short extracts from anything I chose and he’d identify it. Well I was determined to find things he wouldn’t know and to that end produced a tape which included music by these two Bohemians. When he wasn’t able to identify them and I told him the composer’s names he accused me of making them up, along with the others ones I’d included. Eventually when I’d proved that they were genuine he conceded that in fact he didn’t know every composer who existed after all — which fact we all know only too well. Reviewing for MusicWeb International I am constantly reminded that there are hundreds of composers I’ve never heard of which is often the main reason for choosing their discs to review. If that wasn’t reason enough for reviewing these two discs together then how about the fact that Koželuch was a contemporary of Mozart (1756-1791) and whose music frequently foreshadowed Beethoven and Schubert. As for Voříšek, he was born the year Mozart died and died two years before Beethoven. He met Beethoven and became a friend of Schubert. Finally we also have Grand Piano to thank for both discs and for embarking on these musical journeys to record all Koželuch’s piano sonatas — a two year project encompassing fifty sonatas — and Voříšek’s complete works for piano. Whether the current opinion in so many music circles that Mozart is the greatest composer the world has ever seen will ever change is hard to know. It is salutary at times to be reminded that during some periods in history others have been considered greater; one such was Leopold Koželuch. For reasons that are often difficult to understand some composers, however well known and highly esteemed in their lifetimes, suffer neglect after their deaths. In the worst case scenarios their music disappears from view altogether while the works of others continue to be revered down the years. To some extent this is what has happened to Koželuch and helps to explain why four of the five sonatas on this disc are world première recordings 231 years after their composition. When you begin to listen to them their greatness becomes apparent and one can understand why he was considered so highly during his lifetime. After only a couple of plays I’d already completely fallen under the spell of these fabulously tuneful works a feeling that just continues to grow with repeated hearings. If one didn’t know who one was listening to it would be easy and tempting to guess at Mozart as being the composer since we all know he wrote so many works that we cannot be familiar with them all. If it dates from the eighteenth century and is wonderfully inventive with moments of pure brilliance in the writing who else is it most likely to be? At least we’d be in with a chance that it was Mozart surely ... that’ll be a no then. It is always fascinating to learn the way people like this think and New Zealand fortepianist Kemp English who plays these enchanting sonatas also wrote the booklet notes. He informs us that although Koželuch was highly esteemed soon after arriving in Vienna aged 31 his opinion of Mozart was clearly that he was as great a composer as is now thought. This is the reason he declined the offer of becoming court organist for the Archbishop of Salzburg, a position previously held by Mozart. He told a friend that if the Archbishop could allow such a great composer to leave his employ then what treatment could he expect from such an employer. Sometime later though he did succeed Mozart as Emperor Franz II’s Kammer Kapellmeister and Hofmusik Compositor but this time only after Mozart had died. These posts he held until his own death 26 years later. It is equally fascinating to learn the extent to which the popularity of the newly developed fortepiano is down to Koželuch and his insistence that anyone who wished to become a student of his had to embrace the instrument as well. Kemp English is an obviously stickler for detail. He has ensured he plays these sonatas on appropriate instruments that coincide with what Koželuch would have been most likely to have used at the time of composition. Since they were composed over a period of almost 40 years he has used no fewer than five instruments: three fortepianos, two reproduction and one original, a harpsichord from 1785 and a 1798 pianoforte. I shall be interested to hear the other works because the selection on this disc sounds so perfect on the selected instrument, a reproduction made by Americans Thomas and Barbara Wolf, that it is hard to imagine it played on anything else. 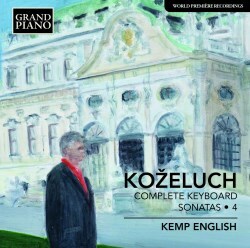 Kemp English also informs us that Koželuch was well ahead of his time in anticipating styles used much later by Beethoven and Schubert as well as incorporating more dramatic introductions than either Haydn or Mozart ever did in their sonatas which numbered 62 and 18 respectively. The sonatas presented here in volume four of the planned complete cycle are hugely enjoyable and the desire to hear them repeatedly is very strong with new things discerned each time. I have been well and truly hooked by the music as well as by Kemp English’s superlative playing. I await further releases with great anticipation. The foundation that people like Koželuch laid down was eagerly taken forward by the new generation of composers who came after. Beethoven was the leading creative genius who made the new pianoforte a medium through which he redefined the piano sonata and much besides. One composer who drew on these new trends was Jan Hugo Voříšek who gave up studying law when the urge to make music outweighed anything else. Despite having the shortest possible career with most of the works he wrote coming in his last six years, he was highly thought of by Beethoven. His friendship with Schubert no doubt exerted an influence too. These pieces, while they don’t involve the depth of feeling or the musical scope of works by Beethoven or Schubert nevertheless have a great deal of charm and invention. After all Voříšek was one of the contributors to the set of variations on the waltz Diabelli wrote which gave rise to Beethoven’s brilliant set. This disc is volume two of the survey of Voříšek’s complete piano music and, like the first, is played in exemplary fashion by Biljana Urban. Voříšek clearly enjoyed the scope that writing variations gave him. The first work here is a set of six, the theme delightfully dreamy and one that is easily retained in the memory long after. The variations maintain much of the theme allowing a clear view of what he did with it. The 2 rondos, Op.18 though quite short show Voříšek’s facility for writing interesting tunes and each of these embodies overtones of both Beethoven and Schubert - praise indeed. Two tone-paintings follow and are more substantial works with both of them showing his mastery of composition and begging the question as what he might have gone on to compose had his life not have been so cruelly cut short by tuberculosis at 34. It is ironic that he was buried in the same cemetery as his idol Beethoven and his friend Schubert both of whom who followed him within three years. For a composer whose life was so short and whose compositions covered an extremely brief span it is incredible to read that Voříšek is credited with having been the first to have written an impromptu, (his one in B flat major dating from as early as 1817), a form eagerly taken up by so many after him not least Schubert who elevated it to new heights. That said those by Voříšek are chock full of good tunes and he uses them efficiently. There is more than a hint of a Schubert tune in the one in F major and one wonders who got it from whom. Both the Eclogue in C, a deliciously dreamy piece with pastoral themes and the earliest piece from 1817, his Stammbuchblatt are equally impressive and even though the latter lasts only a minute and a half shows how much he can fit into a tiny time frame. Voříšek’s name may be little known today but he made his own contribution to music that his fellows readily agreed was considerable. This disc is part of the projected complete piano music by this composer who came from an area of Europe that has given us a large number of composers, not least in the Baroque and Classical periods. He deserves to be remembered. As I said earlier, Biljana Urban illuminates Voříšek’s music very effectively and the disc is extremely enjoyable.